The NHRA Mello Yello Drag Racing Series’ Countdown to One begins this weekend at zMax Dragway with the Carolina Nationals. Our own Toni Montgomery is on-site with an update on Friday’s activities. 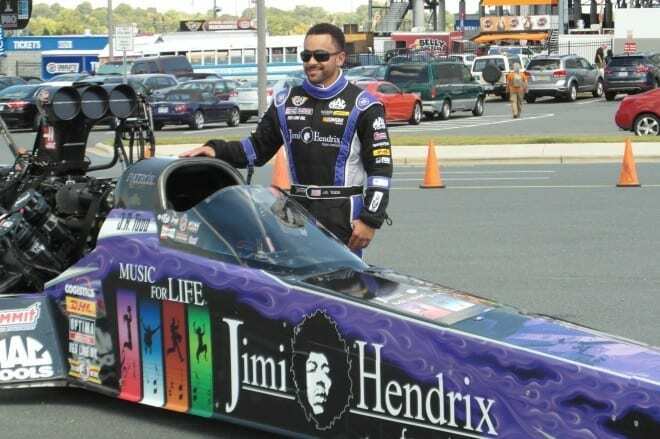 * J.R. Todd and Kalitta Motorsports unveiled the Jimi Hendrix Foundation Purple Haze dragster (pictured above); the team will campaign the car in the first three races of the Countdown as part of their new partnership with the Foundation. * After first round of qualifying, Karen Stoffer was on top in Pro Stock Motorcyle, Erica Enders-Stevens was fast in Pro Stock, Ron Capps held the top spot in Funny Car and Leah Pritchett was fastest in Top Fuel. Wonder if Capps felt outnumbered? It was a good round to be a lady. *The Second round of qualifying shook things up. After two rounds, Jerry Savoie took the provisional No. 1 spot in Pro Stock Motorcycle with a 6.862, 195.59 mph run. Andrew Hines came out in the No. 2 spot while first round fast qualifier Stoffer was third. Greg Anderson was your No. 1 qualifier after day one in Pro Stock with a 6.524, 212.26 mph run while teammate Bo Butner ended up second and Enders-Stevens was third. Nitro qualifying ran into the evening, setting up some fast runs in Funny Car. Tommy Johnson, Jr. set a new track record of 3.971 at 312.42 mph to take provisional No. 1 after day one. Del Worsham was second fastest with Capps in third. In Top Fuel, fan favorite Clay Millican is on top after the first two rounds with a 3.758, 318.77 mph run. Tony Schumacher and Steve Torrence are second and third. Action resumes tomorrow with two more rounds of qualifying. Delayed coverage of qualifying can be seen Saturday night at 11:30 p.m. EDT on ESPN 2. Eliminations are on Sunday. Tags Clay Millican Greg Anderson J.R. Todd Jerry Savoie Tommy Johnson Jr.